Whether you are doing sports to exercise or compete, you will feel the benefits of compression socks designed specifically for sports. SupCare compression socks for sport increase the blood circulation from the feet and back to the heart, helping to prevent blood clots and varicose veins, which is at risk when you put pressure on your legs for a long period of time during running or other sports. Studies show that the use of compression socks during sports reduces the muscle pains by 28%. SupCare's collection for sport is produced with the latest high-tech fibers on the market. These fibers add unique features designed especially for sports. SupCares collection for sport is produced with the latest high-tech fibers on the market. These fibers add unique features designed especially for sports. Among our fibers you will find the populal CoolMax is ideal at high temperatures, as it keeps your legs and feet dry 4 times better than cotton. CoolMax has a unique antibacterial surface that absorbs bad odour. 4 times better than cotton. 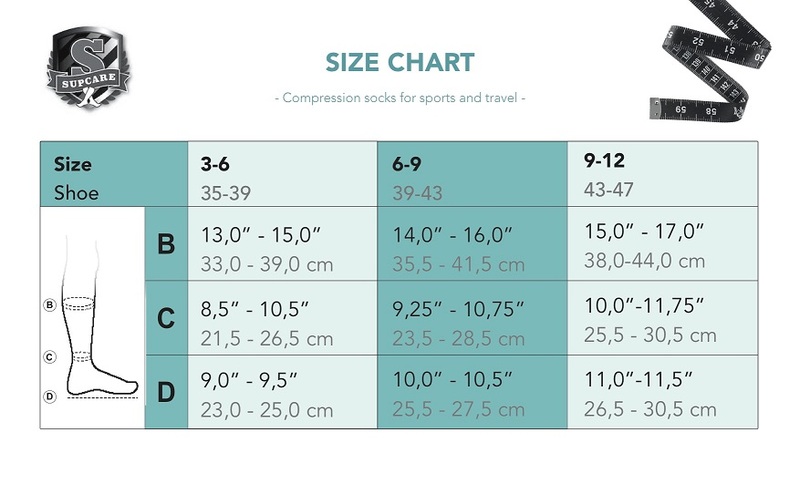 SupCares compression socks for sport increase the blood circulation from the feet and back to the heart, helping to prevent blood clots and varicose veins, which is at risk when you put pressure on your legs for a long period of time during running or other sports.